We already know how many exchange websites exist today. The question now is how many websites are actually “decentralized” in a sense? One of the websites that are moving forward with the current revolution of creating decentralized exchange websites would be Hodlhodl.com. 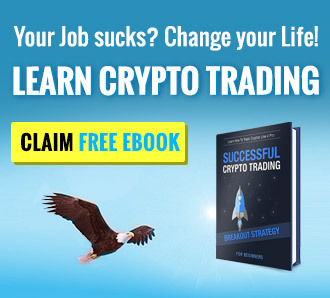 They elevate your regular exchange trading platform into something that is truly decentralized. Today, we will be looking into their website and what they have for us in general. Without further delay, let’s talk about that! To truly make an exchange decentralized, a website should not hold any funds. If your current exchange website allows deposit and withdrawal of funds then you are a part of a centralized exchange. People are now moving away from centralized exchanges to truly decentralized ones pushing the anonymity to a different level. Hodlhodl.com is a P2P cryptocurrency exchange that provides direct service between users without holding either of the two traders’ funds. Instead, the website uses a multisig escrow which minimizes issues and possibilities of theft. Since the website does not hold any users funds, they are not liable to any procedures and simply act as a completely decentralized platform for exchange. 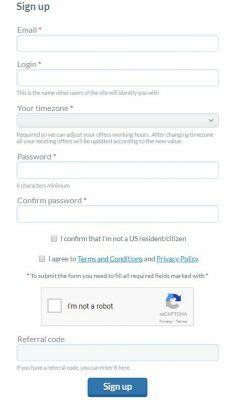 To create an account in Hodlhodl.com you need to have an active email address, username, password for your account and your timezone. You might be wondering why the website would ask for your timezone. This is required so that the website will be able to adjust your working hours and make it easier for transactions to happen. Once everything has been provided, you will be sent a confirmation email to the provided address. After clicking the confirmation link on your email address you will be redirected to their website to log into your account. Now that we’ve created an account on the website, it’s time to log into that account and explore the website. 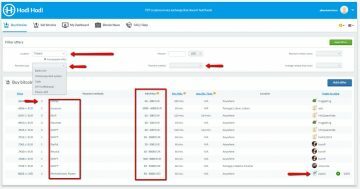 As you will notice, your user dashboard is empty, fill in the information that you want to share with the rest of the users of the website. The most important information that you will be providing will be your BTC and ETH addresses, so make sure that you provide them. The platform is awesome and you wouldn’t have a problem learning your way through the website since everything you need is right before you. What’s even better is that Hodlhodl is waiving all their trading fees until July 2018, which means that you do not need to pay for any trading fees at all. To purchase BTC, all you need to do is click the “Buy Bitcoins” tab located on the upper left-hand side of the website after logging into your account. The first thing that you need to setup before purchasing BTC is the filters tab. This includes your Location wherein you will be able to choose to purchase BTC from people with the same location as you. If the location of the seller isn’t that important to you then all you need to do is leave the “Include Global Offers” box checked. Next is the “Payments Type” tab wherein users will be able to choose which payment type they are comfortable with and of course, have access to. Buyers will be able to choose from Wire Transfer, Online Payment Systems, Cash, ATM withdrawal, and Phone Refill (which might be mobile payment systems). Once the payment type has been chosen, the payment method will then show the available methods depending on the type you have chosen. If the payment type is not a problem for you then just choose “No Value” so that every payment method will be shown. The provided screenshot now shows the best option to go with is the seller Paybis since the seller is the only verified one among the rest. In addition, as you can see we have left most of the boxes empty and just provided the location and let the system find the rest. Available payment methods as of now are: SWIFT, National Bank Transfer, SEPA Bank Transfer, Transfer to a specific bank, Credit Card, Circle, WebMoney, Neteller, Moneygram, OKPay, Payeer, Payoneer, PayPal, PefectMoney, Skrill, Venmo, Western Union, Xoom, Yandex Money, Western Union, Moneygram, In person (P2P), Cash Deposit, AdvCash, ePayments, MoneyPolo, Revolut, Cryptocurrency, GreenDot, Alipay, Zelle, Ria Money Transfer, LeuPay, Payza, FasaPay, Paxum, Paysera, PYC, Hal-cash, Dwolla, CashU, Amazon Gift Card, Itunes Gift Card, Playstation Network Gift Card, OneVanilla, Bay Gift Card, Google Play Gift Card, Xbox Gift card, VISA Gift card, MasterCard Gift card, American Express Gift card, Uber Gift Card, Steam Wallet Gift Card, Apple Gift Card, and Cash by mail. 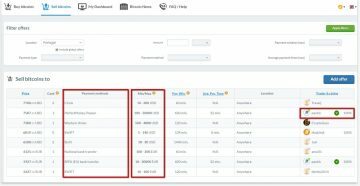 Selling BTC in Hodlhodl.com is generally similar to buying BTC from your peers. Instead of looking for payment methods for you, the challenge now is looking for payment methods that the buyers are comfortable with because you are the one who’s selling BTC. In addition, the minimum and maximum tab will be of great use now because you need to adjust how much you are willing to sell to the abilities of the available buyers that are willing to purchase BTC from you. You can also create an account on their test server and understand how the system works. It’s really easy, create an account and try placing any orders. The platform is just the same as the ones we discussed earlier but with the test server, you will be able to log into any dummy account listed on the website. All you need to open up an extra window and use the login credentials of any account. To log into a dummy account all you need to do is type in username@hodlhodl.com and password is “password”. To understand how it works, a video from the website showing how it’s done is provided below. The website provides ample support for all your questions through their FAQ section. They also have several channels to contact if you want to want to get in touch with their customer service support through their Telegram channel, Twitter account @hodlhodl, or send them a direct email to support@hodlhodl.com. The idea of the whole decentralized crypto idea is perfectly shown on this website by not holding to any customer funds! The website was just launched this year and it has already been creating waves within the community and inspiring other websites to follow their footsteps. Overall, the website is great and with their vision of creating a much better decentralized system is something to look forward to!